You can help Luqman appeal for leave to remain in the UK by supporting our crowdfunding appeal for legal expenses. In 2007 Luqman Onikosi came to the UK from Nigeria to study for a degree in Economics and International Relations at Sussex University. Whilst studying, he was diagnosed with chronic liver disease as a result of Hepatitis B. After graduating he got a job at the Nigerian High Commission in London, until 2012, when his illness flared up and he was unable to continue working. At this stage Luqman put in application for formal leave to remain in the UK, on medical grounds. To maintain his health, every six months Luqman must undergo a liver biopsy, liver function ultrasound scan, a muscle reflex test, a Hep B load test, Fibrosis score test, ALT Score test, E antigen test and liver function test. Effective treatment for the condition, which requires careful monitoring, is not available in Nigeria. He has already lost two brothers, both living in Nigeria, to the same disease. 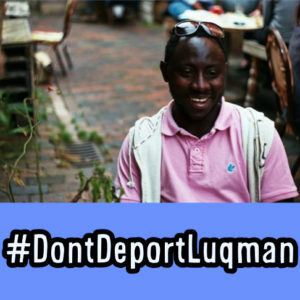 Theresa May and the Home Office threatened to deport Luqman after refusing his leave to remain application. A campaign mobilised to successfully oppose this. With the support of a lawyer working pro bono he was able to submit a fresh leave to remain application on human rights grounds, and remain in the country while the Home Office considered his case. In 2014 he returned to Sussex to study for a Masters in Global Political Economy, funded by a crowdfunding campaign. In May 2015, whilst he was writing his dissertation, the university was informed by the Home Office that he no longer had the right to study because his application had been rejected. The university suspended him, and a spell of bad health forced Luqman back into hospital for 3 months. However, Luqman himself was never informed by the Home Office of his application status. Only in Late January 2016 did he obtain a copy of a letter, dated May 2015, telling him his application had been rejected. He is now at risk of detention and deportation at any time. If deported to Nigeria, a country without the ability to provide him with the care he needs to stay alive, he is likely to suffer the same fates as his two brothers before him. The Home Office has passed a death sentence against this young man. We now call on them to reverse their decision, and immediately grant Luqman leave to remain in the UK. Please help Luqman challenge this decision by supporting our crowdfunding appeal for legal expenses.